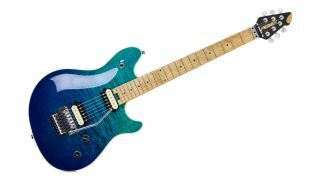 SUMMER NAMM 2017: Peavey has announced the release of a new US-built electric, the HP2, and as the "HP" is for founder and CEO Hartley Peavey, you'd expect the Mississippi firm to have pulled out all the stops on this one. It's a maple-topped and basswood-backed affair by default, but a solid basswood version will also be made available, and both will sport the same cream or black-edge binding. The bolt-on neck and fingerboard are maple, bolstered by a pair ofgraphite reinforcement bars and an easy-access, adjustable steel torsion rod. The oil-finished fingerboard is cut from the same piece of wood as the single-piece neck, for consistency of colour and grain pattern, while stress-relieved lamination also adds increased stability. The HP2 has a 25 ½’’ scale length, 22 jumbo frets and 15’’ fingerboard radius. The 10-degree tilt-back headstock has a 3+3 tuning machine configuration featuring Schaller® tuning machines with pearloid or cream buttons alongside chrome plated hardware. Onboard, there are two custom-wound Peavey humbucking pickups made using a two-step wax-dipping process said to make for ultra-low noise operation and resistance to microphonic feedback. The pickups are mounted directly to the body, further reducing feedback at high volume levels and enhancing response. A Switchcraft® 3-way toggle switch allows selection of pickups in up, center and down configurations. Players will also find either a Peavey/Floyd Rose licensed, double-locking tremolo assembly or tune-o-matic/stop tailpiece fixed-bridge to complete the guitar. Finally, the two push-pull knobs for volume and tone split the pickups individually.